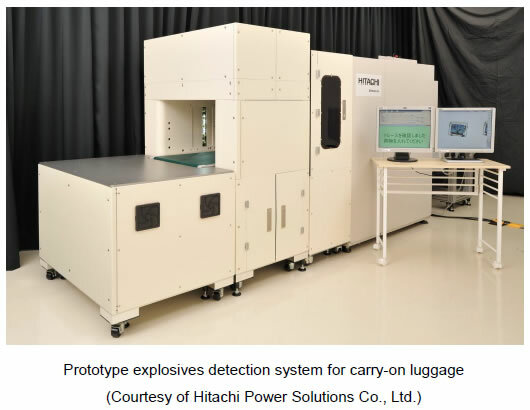 Tokyo, September 25, 2013 - Hitachi, Ltd. (TSE: 6501, "Hitachi") has developed explosives detection technology to automatically inspect for explosive substances adhering to luggage to strengthen security in public facilities such as airports. As a result of this technology, inspection of carry-on luggage which previously took time as it required an inspector to wipe the luggage can be carried out in a minimum of approximately five seconds. By combining this explosive detection equipment with the conventionally installed X-ray inspection equipment, it will be possible to successively conduct inspection for both dangerous items as well as explosive substances without slowing down the flow of visitors to important facilities. This development was conducted under the "R&D Program for Implementation of Anti-Crime and Anti-Terrorism Technologies for a Safe and Secure Society" in the Ministry of Education, Culture, Sports, Science and Technology Funds for integrated promotion of social system reform and research and development. Today, all luggage undergoes X-ray inspection to check for the presence of dangerous items at airports. There is also technology where luggage may undergo further inspection by an officer who wipes the surface of the luggage to analyze for the presence of explosive substances. By automating this wiping test and combining it with the X-ray inspection equipment, it will be possible to inspect all luggage for dangerous items and explosive substances, preventing such items from being carried on board as well as discouraging attempts, thus helping to achieve a safer society. From this perspective, Hitachi has developed explosive detection equipment for carry-on luggage. To date, Hitachi has been developing highly sensitive mass spectrometry technology to identify explosive substances. In 2012, in collaboration with The Nippon Signal Co., Ltd. (TSE: 6741) and the University of Yamanashi, Hitachi prototyped a boarding gate with built-in explosives detection equipment. The technology developed this time, employs this mass spectrometry technology and automatically analyzes for explosive substances adhering to hand luggage of various sizes while moving on a conveyor belt. Features of the technology developed are as below. In order to efficiently detect explosive substances or dangerous items, it is necessary to join the X-ray inspection equipment with the explosives detection equipment so that inspection can be carried out a moving conveyor belt. Technology was developed, using air, to remove and collect explosive particles adhering to the surface of carry-on luggage of varying size moving on a conveyor belt. The timing of generating the air jet, angles and speed were optimized to efficiently remove and collect fine particles of explosive substances. To efficiently concentrate the fine particles of explosive substances removed and collected from the carry-on luggage, a cyclone-type preconcentration technique was developed. As a result, the fine particles adhering to carry-on baggage were concentrated in a short time using a large quantity of air flow, enabling high sensitivity detection using mass spectrometry. A prototype of the carry-on luggage explosives detection equipment was developed with the new technology, and it was confirmed that inspection of particles adhering to the luggage could be conducted in a minimum of five seconds. Further, with the cooperation of Hitachi Power Solutions Co., Ltd., a subsidiary company of Hitachi,Ltd., the equipment was joined with commercial X-ray inspection equipment, and it was confirmed that mass spectrometry analysis and X-ray inspection could be conducted in succession. The technology developed can be described as key technology in allowing the successive inspection for explosive substances on luggage followed by X-ray inspection for dangerous items without disrupting the flow of people entering airports and other important facilities. The equipment will be on display conducting verification tests at the Special Equipment Exhibition & Conference for Anti-Terrorism (SEECAT '13) to be held from 2nd - 4th October 2013 at Tokyo Big Sight, Tokyo, Japan.